The Jardin des Martels is in Giroussens, north of Toulouse in the Tarn department of south west of France. The Jardins des Martels is a large garden covering three and a half hectares. 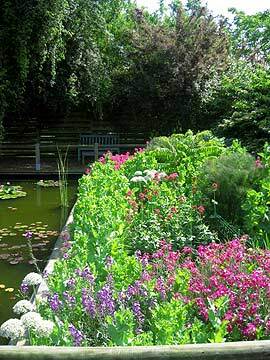 The Jardin des Martels is a fabulous garden, classed as one of the most beautiful in France. If you are nearby it is definitely worth a visit. 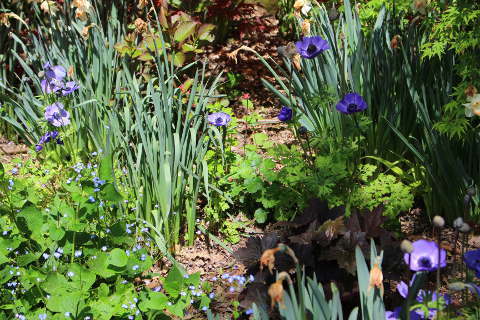 The garden is laid out in an 'English style' with large colour themed flower borders. 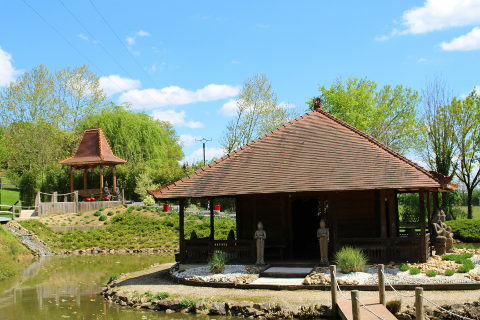 There are also large ponds filled with waterlillies and lotus flowers, a tropical greenhouse and even a mini farm there is a lot to see in this garden and you can even buy many of the plants you have seen in the garden centre at the end of the visit. The garden is particularly good at providing inspirations to take home to your own garden as it has lots of themed gardens. 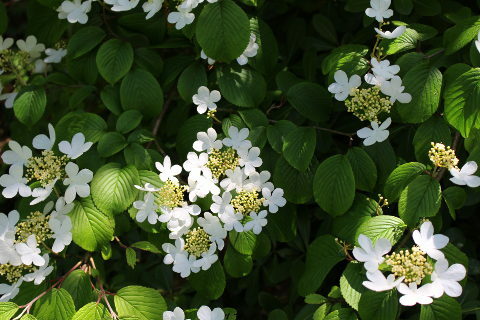 For example there is a shady garden full of hostas, hydrangeas, viburnums, acers and lots more. A pink garden with cistus, lavatera and hibiscus and a blue garden with vitex, agapanthus and geraniums. 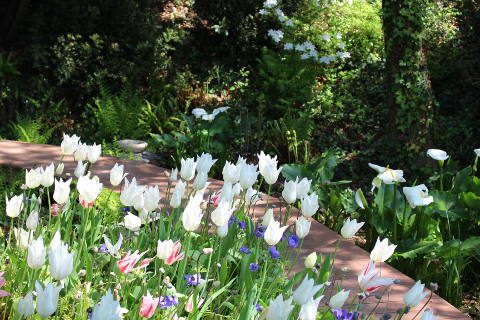 Other gardens include a bulb garden and a mediterranean garden. In 1994 the Reynier familly decided to stop farming and devote their time to their hobby - plants. Three years later the garden des Martels was opened to the public. Today more than 40 000 visitors enter the garden each year. 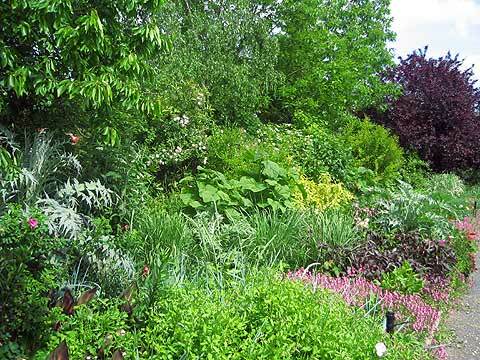 Some favourites plants in the garden include: roses (150 species), irises (120 species), ceanothus (55 species), and viburnums. The ceanothus collection is the biggest in France. 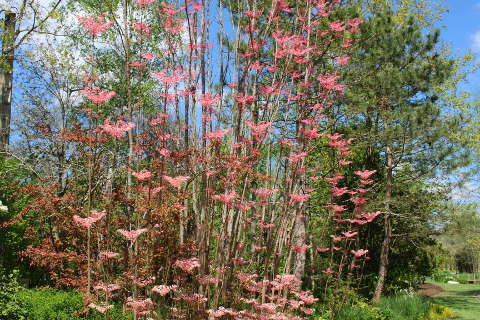 When I visited recently in April I was amazed by the sight of a clump of tall branches topped with plumes of flamingo-pink leaves. (see main picture) I have never seen the tree before. 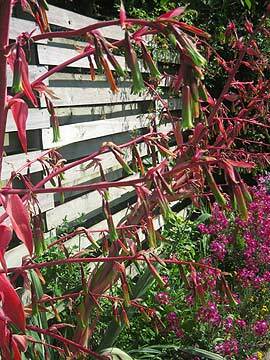 It turned out to be a Cedrela tree, Cedrela sinensis 'Flamingo' which has now been renamed Toona sinensis 'Flamingo'. Apparently the leaves are bright pink for a few weeks only but what a great spectacle. Note that young plants are sold in the garden centre - I couldn't resist! 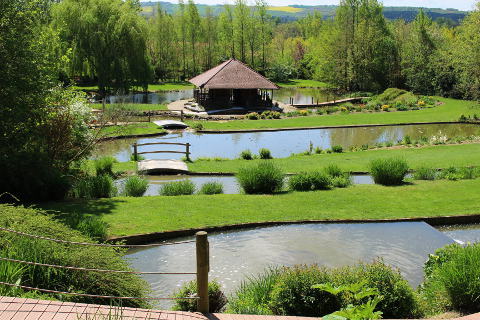 The garden can be accessed as part of the Chemin de Fer Touristique du Tarn. This is a small tourist railway line which stops at various interesting places along its route. There is a small cafe on site selling sandwiches, paninis and drinks at lunchtime however it is not open every day. The garden is open every day from May to August 10.00 - 18.00, every afternoon in April, September 13.00 - 18.00, and 1-17 October Saturday, Sunday and Wednesday afternoons from 13.30 to 18.00. The garden is also open during the Toussaints holiday at the end of October / begining November. At the begining of July the Jardin des Martels hosts a Lotus Festival to tie in with the flowering of its Lotus plants. The garden may close if the weather is bad. The entry price is 8 euros for adults, 5.20 euros for over 11s and 4.20 euros for over 4s. 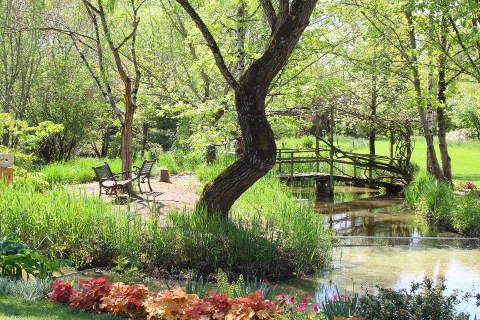 This garden is 30km north of Toulouse. The Jardin des Martels is situated between Toulouse and Albi both of which have some very attractive town gardens. In Albi there are the gardens of the Berbie palace, right on the edge of the Tarn river. There is also the Rochegude garden in the middle of the city. In Toulouse visit the Jardin Japonais near the Palais de Congres and the Jardin Royal and Jardin des Plants near the Palais de Justice. The Jardin des Paradis in the equally lovely town of Cordes sur Ciel is well worth a visit.